1957 December 14 German Air Force team with Walter Krupinski evaluates the Lockheed Starfighter at Edwards AFB; pilots OTL. Werner und Maj Krupinski. 1958 December 8 Oberstleutnant Rall makes his 1st flight in a F-104B Starfighter with Lockheed test pilot Lou Schalk. 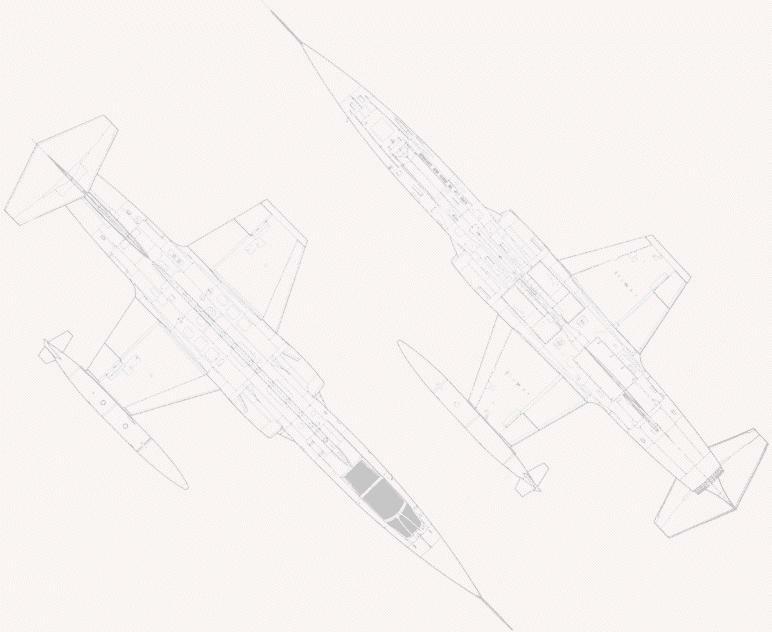 1959 February 6 contract signed for 30 F-104F trainer to be built by Lockheed, construction numbers: 5047-5076. 60 aircraft for JaboG 31 and 6 aircraft for the CAT I tests at Palmdale. modified 1959 to F-104G configuration (bigger rudder) for system tests (flight controls), 1960 for NASARR-tests. 1959 December contract signed for 30 additional F-104G to be built by Lockheed, construction numbers: 2068-2097. 1960 January 18 4./WaSLw 10 starts 1st transition course on F-104 at Norvenich AB. 1960 February 22 German flight training in USA commences at Palmdale, California "Conversion Flight F-104F". 1960 February 24 1st solo flight of a German pilot in a F-104F Starfighter by Oberstleutnant Rall. 1960 May 30 1st F-104F arrives in container at Norvenich AB. modified 1959 to F-104G configuration for fire control system tests, 1966 sold to NASA. 1960 July 14 1st flight of a F-104F at Norvenich AB (F-104F construction number 5055 BB+368) by Major Bob Faulkner. 1960 July 21 official public presentation of the F-104 "Starfighter" at Norvenich AB (F-104F construction number 5055 coded BB+368). 1960 July 22 1st flight of Luftwaffe pilots with F-104 "Starfighter" at Norvenich AB with German codes, one of them being OTL Rall. 1961 March 29 Luftwaffe loses its first Starfighter, F-104F BB+375 (cn 5062) at Korbach after engine failure, both pilots ejected safely. Jagdbombergeschwader 31 "Boelcke", Jagdgeschwader 71 "Richthofen", Aufklärungsgeschwader 51 "Immelmann". 1961 May 1 4./WaSLw 10 renamed II./WaSLw 10. 1961 June 6 Oberstleutnant Rall makes his 1st flight in a F-104G Starfighter at Palmdale. 1961 August 9 1st flight of a reassembled F-104G by MTT (DA+106), flown by Messerschmitt chief test pilot James Leake Jester. 1961 August 10 1st reassembled F-104G by MTT DA+106 handed over for the Luftwaffe to General Josef Kammhuber, InspGenLw. 1961 October 5 1st flight of a Messerschmitt (MTT), Manching manufactured F-104G (KE+301). and General Josef Kammhuber, InspGenLw (KE+301). 1961 October 3 2./JaboG 31 starts transition to the F-104G. pilot was Oberleutnant Bernd Kuebart. 1961 December Olt Erhart Gödert of the Joint Test Force at Edwards AFB, flies as 1st German pilot below Sea Level with supersonic speed (in Death Valley, CA). 1962 February 21 1st F-104G DA+106 arrives at Nörvenich, flown by OLt Schultz (construction number 2025). 1962 April 13 1st flight of the Kommodore JaboG 31 Oberst Barkhorn with a F-104G at Nörvenich AB. 1962 April 203 Squadron Leader (Staffelkapitän) of the 312 Squadron Major Neumann flies the 1st training flight of JaboG 31 "Boelcke". 1962 May 22 1st tragic F-104G accident during take-off from Norvenich after an engine failure, pilot ejected safely. 1962 June 19 4 F-104F crash during demonstration practice near Knapsack. 1962 June 20 official commission of the 1st Luftwaffe F-104 wing: Jagdbombergeschwader 31 . 1962 August the first F-104G for JaboG 33 landed on Buchel Air Base which was the beginning of the “Starfighter” era. 1963 April 9 Jagdgeschwader 71 "Richthofen" receives the 1st Starfighter, KH+112 (cn 9012) was flown by Oberleutnant Manfred Fischer. The second F-104G HK+114 (construction number 9014) was flown by Oberleutnant Diether von Olleschik. 1963 July 15 1st deployment of 2nd squadron JaboG 31 to Decimonannu, Sardegna for special weapons delivery training (until August 20). KE+377 (construction number 7077) was the first F-104G delivered from Messerschmitt to MFG 1. 1963 November 1 JaboG 31 "Boelcke" assigned to NATO. 1963 November 11 first F-104 operational flight of Marinefliegergeschwader 1 (MFG 1) at Jagel AB. 1964 February 17 II./WaSLw 10 moves to Jever AB with 16 F-104F. 1964 April 1 First F-104 student sortie flown under USAF/German AF F-104 Starfighter Foreign Military Sales (FMS) Program. 1964 May 12 1st F-104G for JG 74 lands at Neuburg AB, KG+303 (cn 8203) was flown by W. Diegmann of ErpSt 61, wing code JD+102. 1964 June 1 312 Squadron of JaboG 31 "Boelcke" assigned to NATO in the Strike role. 1964 June 8 1st F-104G arrives for JaboG 34 at Memmingen AB. 1964 September 7 September 7-18, 1964 first Squadron Exchange with F-104G of the Luftwaffe . 312 Squadron operates with 92nd Tactical Fighter Squadron (TFS) at Bentwaters, Great Britain. 1964 October 1st F-104 transition class 65-H starts at Luke AFB (Graduation on June 4, 1965). 1964 November 5 1st F-104G coded KG+345 for AG 52 lands at Leck AB; later coded EB+239 (construction number 8246). 1964 December 16 1st F-104G for JaboG 32 lands at Lechfeld AB. 1965 February 2 JaboG 36 receives the 1st F-104G (serial number KH+156), flown by Kommodore LtCol Kmitta. 1965 March 17 Marinefliegergeschwader 2 at Eggebek AB receives the 1st RF-104G from Fiat, Turin. flown by Kapitänleutnant Karmann (serial number KC+141, construction number 6630). 1965 June 2 DA+103 (construction number 2055) flown by Hptm Siegfried Heltzel has a Midair collision with a DO-28 D-IBEW near Koblenz. The Do-28 D-IBEW crashes, Hptm Heltzel manages an Emergency Landing at Norvenich AB. With the landing speed of 435 Km/h (270 mph) he marked the fastest landing speed ever reached. This Emergency landing got an entry in The Guinness Book of Records in 1988. 1965 June 11-25 JaboG 31 takes part in the 4.Tactical Weapons Meet at Chaumont, France. 1966 May 16 JaboG 33, 1st wing of Luftwaffe with 25.000 flight hours on the F-104G. 1966 August 28 JaboG 31 reaches 25.000 flight hours on F-104G. 1967 March 8 Contract with Martin-Baker was signed to re-equip the entire German F-104G force with the Martin-Baker seats. 1967 April 1 Marinefliegergeschwader 2 at Eggebek AB establishes a second squadron with the F-104G Fighter Bomber variant. 1967 November 13 Tactical callsign change ordered. 1968 July 20+38 (c/n 2045) is the 1st F-104G of the Luftwaffe with 1.000 flight hours. 1968 March 22 JaboG 32 marks 25.000 flight hours of F-104G operations. 1968 August 2 JG 74 marks 25.000 flight hours of F-104G operations, flown by OLt Pohl. 1968 August JaboG 33 marks 50.000 flight hours of F-104G operations. 1968 September 24 First successful use of a Martin Baker GQ-7 seat to escape from a German F-104G of JaboG 33 took place at Ramstein AB. during an emergency landing the pilot ejected safely through the fireball, 22+02, construction number 7072. 1968 December 19 JG 71 "Richthofen" first year with 10.000 flight hours on F-104s. 1969 April 15 AG 51 relocates from Ingolstadt AB to Bremgarten AB according movement orders dated March 28, 1968. 1969 August 19 GAF recorded the 100,000th flying hour in the F-104 at Luke AFB (flown by Technical Sergeant Ralf Pilawa). 1969 September 1 Exercise "Cowboy" long range navigation flight to Luke AFB, USA (until September 11), flight leader Oberst Stöcker. 1969 September 23 AG 51 reaches 50.000 flight hours on F-104G. 1969 October 10 contract signed for 50 additional F-104G to be built by MBB, construction numbers: 7301-7314; 7401-7436. 1970 June 25 JG 71 marks 50.000 flight hours of F-104G operations. 1970 October 29 JaboG 31, 1st wing of Luftwaffe with 75.000 flight hours on F-104G. 1970 September 10 WaSLw 10 marks 50.000 flight hours of F-104 operations, flown by Hptm Reiner Karlstedt. 1970 December 7 JaboG 33 marks 75.000 flight hours of F-104G operations. 1971 February 17 JG 74 marks 50.000 flight hours of F-104 operations. 1971 May 10 8 F-104F make the last flight to Erding AB. 1971 June 26 JaboG 32 represents the Luftwaffe at the Aviano Airshow, Italy. 1972 June 14 "Doc Charly", Dr. Karl-Heinz Schneider flies his "First Solo" with a F-104G, he is the first "Flying Flight surgeon". 1973 February 6 JaboG 31, 1st wing of Luftwaffe with 100.000 flight hours on F-104G. 1973 March 1 JG 71 marks 75.000 flight hours of F-104 operations. 1973 May 14 JaboG 33 marks 100.000 flight hours of F-104 operations, flown by Maj Peter von Stackelberg at Erding AB. 1973 September JG 74 marks 75.000 flight hours of F-104 operations. 1973 November 22 Decoration of JG 74 with the name of famous World War II fighter pilot Jagdgeschwader 74 "Mölders"
The decoration "Mölders" was withdrawn on March 11, 2005 and the wing was renamed Jagdgeschwader 74. 1974 January 11 20+01 (c/n 2001) 1st F-104G of the Luftwaffe with 2.000 flight hours. 1974 September 19 JG 71 "Richthofen" last F-104 flight, pilot Hptm Harry Giese, fly-out to Erding AB. 1974 October 7 JaboG 34 marks 100.000 flight hours of F-104 operations. 1975 February 14 JaboG 32 marks 100.000 flight hours of F-104 operations. 1975 September 5 MFG 2 marks 100.000 flight hours of total flying operations. 1976 December 1 JaboG 32 marks 200.000 flight hours of total flying operations, a/c 21+01, pilot Major Adi “Oberst” Obersteller. 1977 September JaboG 31, 1st wing of Luftwaffe with 150.000 flight hours on F-104. 1977 November 9 MFG 1 marks 100.000 flight hours of F-104 operations within Luftwaffe and Marine combined, pilot Kommodore KptzS Scholz. 1978 November 13 MFG 2 marks 100.000 flight hours of F-104 operations. 1979 October 15 JaboG 31, 1st wing of Luftwaffe with 175.000 flight hours on F-104. 1979 October 18 JaboG 33 marks 175.000 flight hours of F-104 operations, 3 days later. 1979 November 30 JaboG 32 marks 150.000 flight hours of F-104 operations. 1980 October 2 MFG 1 marks 125.000 flight hours of F-104 operations. 1981 April 7 Oberstleutnant "Yogi" Söldner of JaboG 32 marks 3.500 flight hours of F-104 flying, he finally reaches 3.814 hours F-104! 1981 September 6 Starfighter 20+02, the oldest F-104 of JaboG 32 was withdrawn for use after 21 years, flown by Oberstleutnant "Yogi" Söldner, handed over to Lw Schleuse 11 at Manching. 1981 October 29 MFG 1 last F-104 flight; MFG 1 accumulated 131.915 F-104 flight hours. 1982 April 3 JaboG 33, 1st wing of Luftwaffe with 200.000 flight hours on F-104. 1982 April 21 JaboG 31 marks 200.000 flight hours of F-104 operations, flown with the oldest F-104G 20+01. 1982 September 17 JaboG 32 marks 200.000 flight hours of F-104 operations. 1983 March 16 Last official flight at Luke AFB - Deactivation of the 69th TFTS and 2nd Luftwaffe training squadron. 1983 April 30 JaboG 31 last F-104 flight; JaboG 31 accumulated 211.421 F-104 flight hours. 1983 August 14 MFG 2 marks 150.000 flight hours of F-104 operations. 1984 April 18 JaboG 32 last F-104 flight; JaboG 32 accumulated 204.986 F-104 flight hours, flown with the "weiß-blau" F-104G 20+36. 1984 May 9 commissioning "F-104 Kommando" within LVR 1 at Erding AB, flight continuation unit for pilots waiting for Tornado conversion. 1985 May 30 JaboG 33 last F-104 flight; JaboG 33 accumulated 231.900 F-104 flight hours within 23 years, which is a record for a wing. 1985 December 5 MFG 2 marks 200.000 flight hours of F-104 operations. 1986 August 11 MFG 2 exercise "Farewell" long range navigation flight with the "Vikings" to NAS Moffett, USA (until August 21). 1986 August 25 MFG 2 last F-104 mission after 4.228 flight hours in total during the last year. 1986 August 26 MFG 2 transfer first 6 Starfighter to Erding AB. Until September 3, 1986 all F-104 are deployed to give room for the Tornado. 1987 May 26 Last flight of Marinefliegergeschwader 2 to Erding AB, flown by Kommandeur der Marinefliegerdivision, Flottillenadmiral Dubois. 1987 October 23 Last operational flight of a German Luftwaffe F-104 with JaboG 34 at Memmingen AB. 1988 September 19 "F-104 Kommando" last F-104 flight and decommissioning; "F-104 Kommando" accumulated 9.895 F-104 flight hours. 1991 May 22 Last flight of a German F-104 with WTD 61 at Manching AB, 98+04 ex 26+60 (construction number 7406).